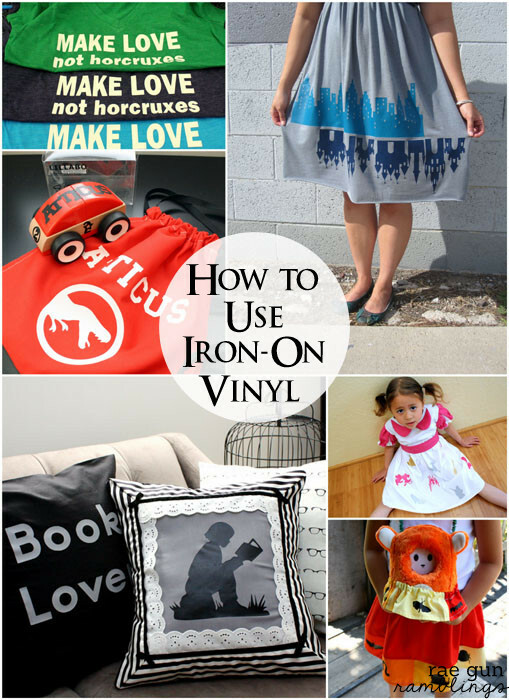 You know since I discovered iron on vinyl I’ve been throwing it on absolutely everything but I realized I don’t have a good detailed post on how to use the stuff. 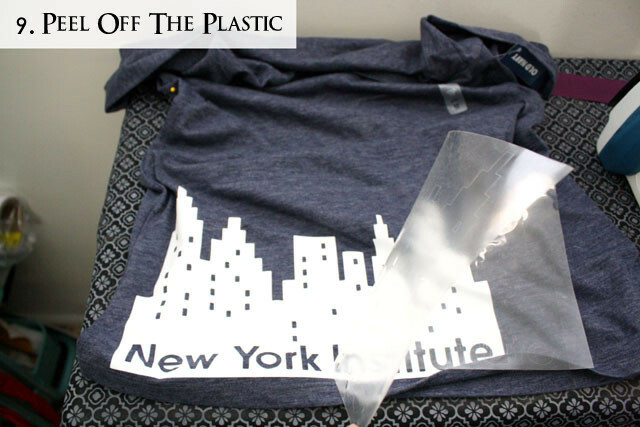 I’ve got loads of projects where I mention the steps but I thought it might be helpful to share a step by step, picture filled tutorial on how to use iron-on vinyl. 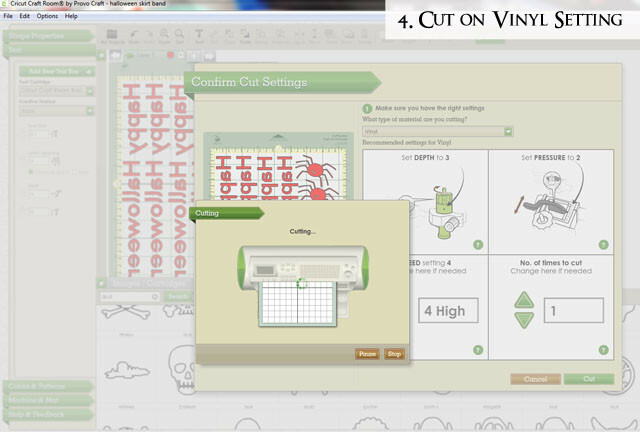 I always use my Cricut to cut my vinyl but you should be able to use the same method with other cutters or even an exacto knife although it might make it a bit more annoying. 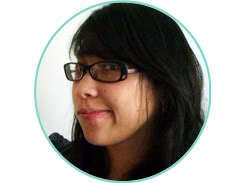 But I really love my Cricuts (yeah I have two) and I think the ease of use makes it totally worth it. 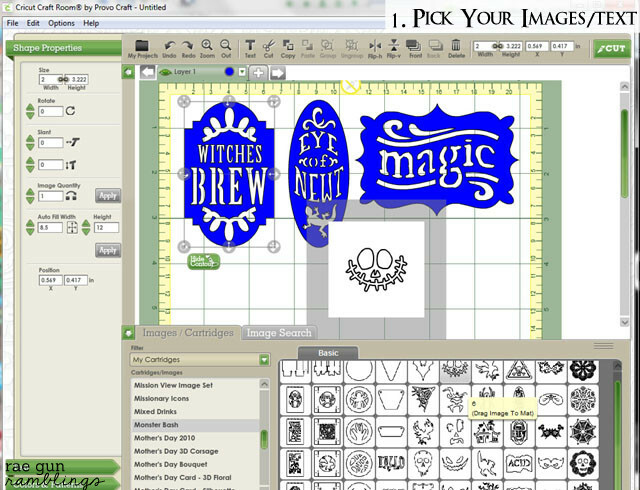 The newer Cricut machines work with physical cartridges and plug into your computer so you can just find/buy designs on Cricut Craftroom. I love this. Usually when I start a project I just search in the image search or type up my text. I recently learned that you can get a kind of font guide by typing the letter A in and then you can see all the different types of As (and what cartridge they are on) from you search. This time I wanted to play with the new Monster Bash images so I just clicked on that from the list and scrolled. I found a couple of cute things. To add the image to the mat you just click on it. When the image is highlighted you can adjust the size, turn it, or move it. For iron-on vinyl you want to get the mirror image. It’s not important unless you have text or an image you need to face a certain direction. Let me tell you it’s not a matter of if but when you go to cut and you’ve forgotten to flip your images so I highly recommend just getting into the habit of that whenever you have an iron-on vinyl project whether it’s necessary or not. See the little arrow buttons that face eachother at the top? Just click on that and it will invert it for you. Or if you’re braving cutting something manually invert the image before you print/trace it to use as your guide. Cut your vinyl to fit your mat. Then position it PLASTIC SIDE DOWN and vinyl side up. There is a layer of plastic that will be peeled away. It’s the shinny side. So again that’s shiny side down. You want to do something called a “kiss cut” it will make everything loads easier especially if you have lots of small pieces like words or designs. The kiss cut should cut the top layer (the vinyl) while leaving the bottom layer (the plastic) more or less in tack. That way you can just peel off the negative space and use the plastic to manuver. Sure you can take the individual pieces if it cuts it all the way through but the kiss cut makes things WAY easier. On both of my machine the proper setting for this is Depth 3. Pressure 2, and Speed 4. The just send it to cut. 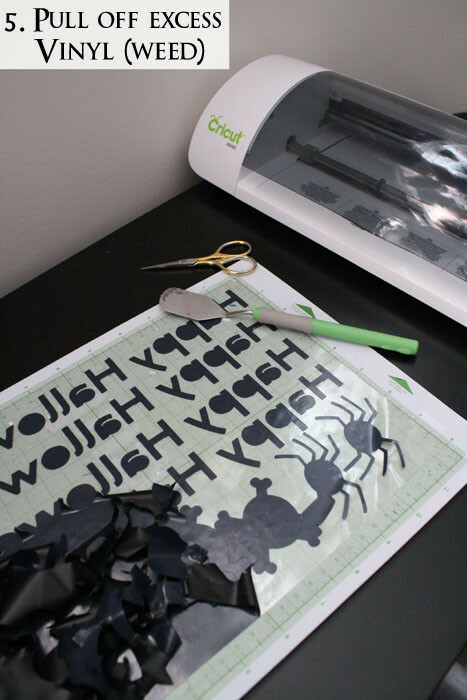 Once you unload your cutting mat peel away an of the excess vinyl. This step is called weeding. I like to use my fingers first and start from one corner and slowly pull and get as many of the big pieces off at once. Then I like to go back with my little poker tool (Cricut has a whole tool kit that is super great and makes all this stuff much easier). Then I remove all the little pieces or the pieces attached to little details like the middle of letters or right by the antennae. If you did the kiss cut you should have a sheet of plastic with some pieces of vinyl on it. If it’s the perfect layout just leave it like that. 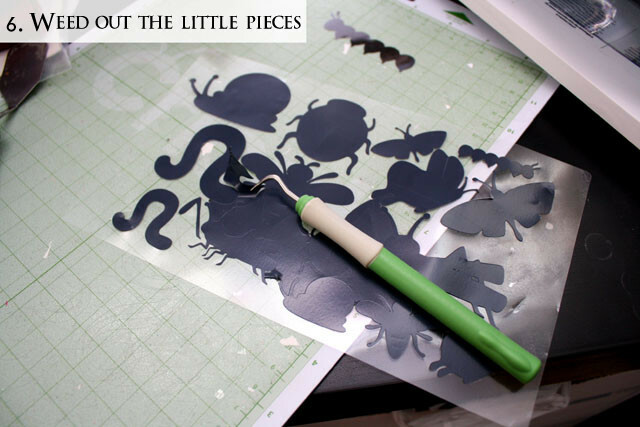 If you want to spread out your images you can cut them apart. Then just position them on your fabric PLASTIC SIDE UP this time. With a hot iron (mine is a little down from cotton so not the max hottest setting) Iron through the plastic. Hold for a few seconds still and then wiggle and them move positions until you’ve hit all the vinyl. Gently pull on an edge if the vinyl comes up with it iron some more. This step takes the longest especially if you have a large image. Next I like to flip it over and iron a little from the back. Once you are sure the vinyl is securely attached pull away the plastic. Feel around the vinyl especially at the edges to see if there are any spots that need reinforcement. 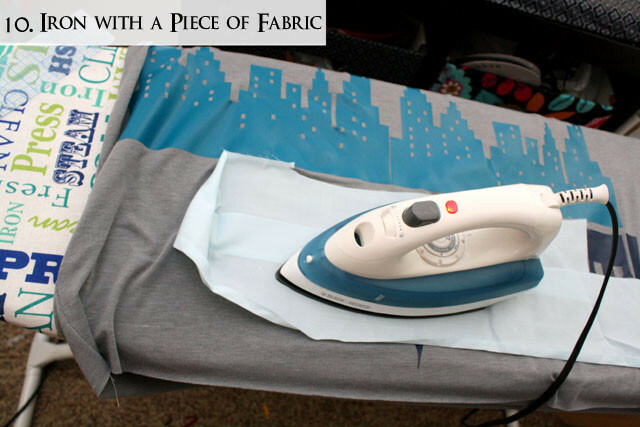 I don’t always do this step but I find it helpful especially on larger projects where my patience might have me speeding through the last few steps but I place a clean thin piece of fabric down and iron through the fabric for one last bit of attaching. And there you have it. Now you can customize anything to your hearts content! Where do you buy your vinyl please? 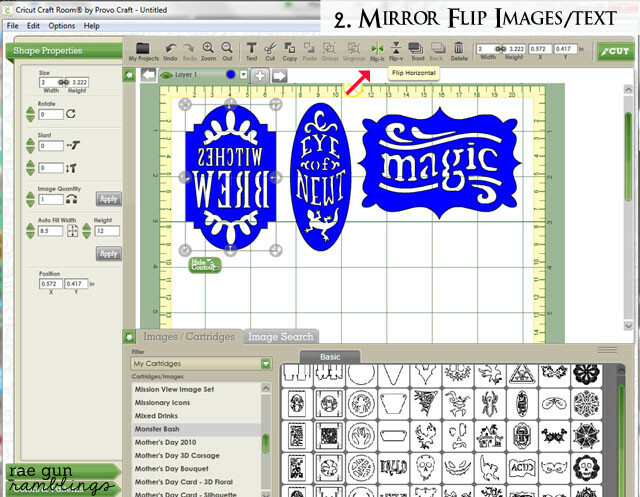 I buy most of mine at a wholesale place locally but I’ve also used this stuff that Cricut sells http://www.amazon.com/gp/product/B00BVUFXZK/ref=as_li_tl?ie=UTF8&camp=1789&creative=390957&creativeASIN=B00BVUFXZK&linkCode=as2&tag=raegunram-20&linkId=FOEYTXQK6RKN6WUR and I really like it. Great tutorial Marissa! I have vinyl and a Silhouette with no clue and this was very helpful! Oh yay so glad you found this helpful! I LOOOOVE using vinyl on my sewing projects! What is the plastic called that you put the vinyl on? Are you talking about the cricut cutting mat? THe vinyl comes attached to a layer of plastic that you pull off but when I cut it I put it on a mat. 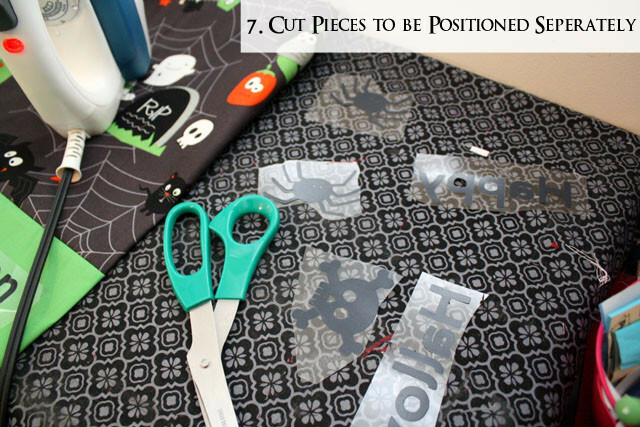 Do you have to use a certain Cricut cutting mat or just the standard one? 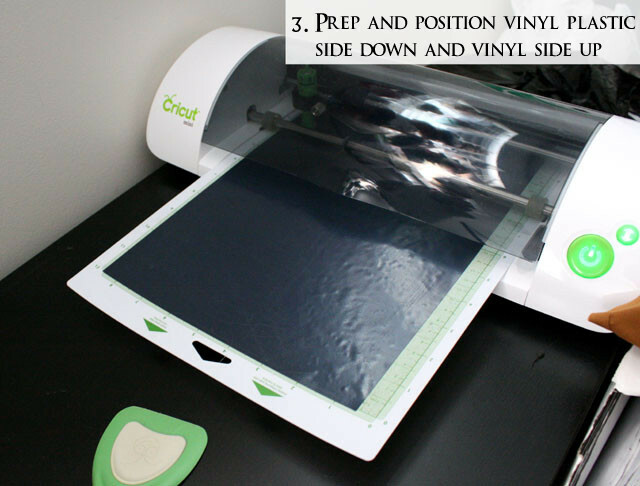 I’m seeing a lot of reviews that the cricut vinyl comes off after washing the garment- have you had trouble with this? Thanks for sharing this cool idea.. 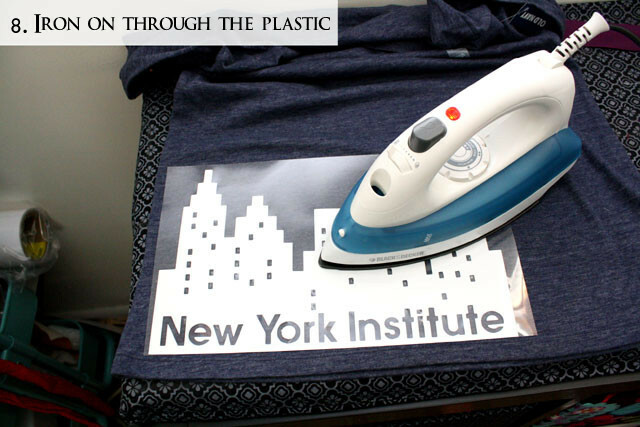 So instead of iron can I use my heat press machine for heating the transfer?